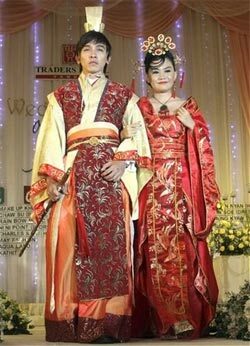 Wedding customs in Myanmar vary according to ethnic groups. Especially country like Myanmar have different kinds of wedding ceremonies because we have varieties of creeds. Weddings in the metropolitans have parades or car for the wedding processions; full fledged band instruments such as trumpets and trombones, ferry lights all over the house which is naturally more expenses. These weddings are completely different from the traditional remote village weddings. They are very simple for very rich in culture. Since the time of birth until they become adults, Myanmar celebrate 12 auspicious occasions. We are now going to present, one of these 12 auspicious occasions, “ The wedding ceremony ”. When a boy and a girl come of age and, love one another and will want to marry and live happy ever after, a wedding ceremony will be performed for them where their parents, relatives, honourable guests and friends are invited, so that they will be recognized as a newly married couple. This wedding ceremony we present, celebrated according to Myanmar Traditions and computable to the modern age. There are also court marriages usually performed by judges ranging from township to Supreme Court Justices, depending on the wish and accessibility the partners. Wherever the wedding is performed, the couple wants to show and receive acceptance from society that they are eligible and duly married before respectable personages. Here we are presenting the court marriage of a youthful, vibrant and beauteous couple. Not so large a number of guests have already gathered, as the ceremony is to commence soon. Court marriage requires judge as well as witnesses. The wedding ceremony we are presenting now has the good fortune of having the presiding judge and the witnessing law officer, both of whom are accompanied by their wives. Firstly the bride signed her signature to two copies of the marriage documents and the groom-followed suit. After the witnesses signed, the judge gave his blessing and best wishes and signed in the document and the court register. Thus, the couple became husband and wife legally. With the successful conclusion of the ceremony, the invited guests are having refreshments offered by the newly wed couple. Henceforth, the new couple is going to raise a happy family. Nowadays, the Traditional Weddings usually take place at the Hotels in big cities like Yangon and Mandalay. The hotels have wedding packages for the brides and the grooms. All the family members, friends, associates, colleagues and neighbours are invited to the wedding. As we have seen the different way of wedding such as wedding in the air during sky diving, under water wedding in ocean during scuba diving, wedding in the highest peak of the world, Mt. Everest during expedition any many more unique ways to cherish the moment for lifetime. The traditional wedding in Myanmar is one of those experiences to gather. As mentioned earlier, wedding customs in Myanmar vary according to ethnic groups and castes we have tried to cover all most all different tradition as follows. Please Just tell us as much as you have in mind: your special desires, your budget, how many days, the destinations you prefer, how many people in your group, what kind of rooms, and any other special requirements. Our travel consultants help you make the most of your travel time and dollars. You will get our email response within 24 hours.